Today I got an email from 73rd pointing me to a model he just finished using a technique I shared with him here. 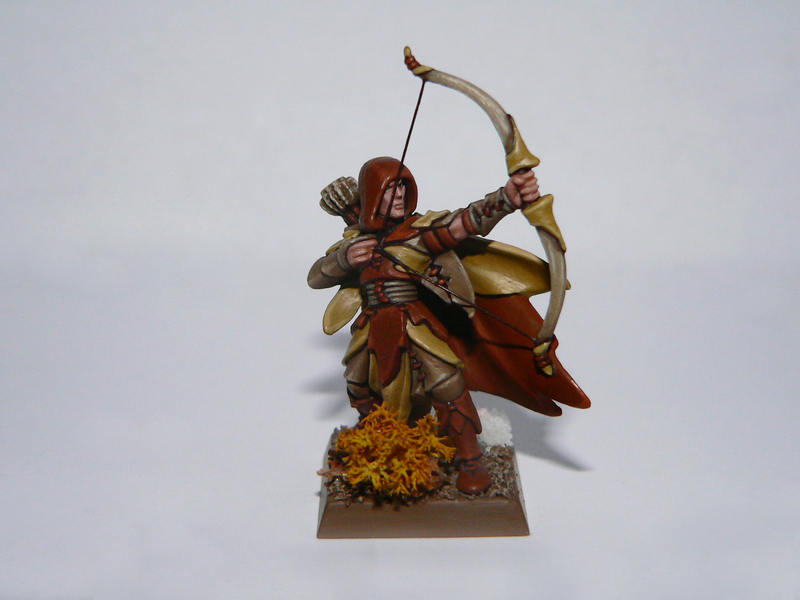 The model is a Wood Elf Glade Guard and can be seen here on his blog, Whispering Woods. Actually he emailed me a question a few weeks ago and I told him I would see what I could do with trying to explain "blending." The post I put up on FTW can be found here. It was a real simple thing on wet blending and how I go about it to get fairly decent results, nothing Golden Daemon, but a little better than average if you take your time with it. So 73rd takes this little nugget and runs with it... the result being a great looking model that he should defnitely be proud of. Nice work 73rd and I'm glad I could help out a little bit. UPDATE: I've since posted again about wet blending, this time with a much more in-depth article. You can find the article here. If you're looking for an alternative to wet blending and ar comfortable with washes, you could try the method I used on the cloak as seen in this post here. I read the wet blending blog with interest. I intend to try it, when opportunity arises. 73rd: Thanks, most of the stuff I do is simple honestly. There are far more complex techniques out there but I shoot for tabletop quality with my stuff. This is a quick and easy way to get a good result. Just like your model shows. Good reasons to blog. Wood Elf looks great, we all learn a little and share the rewards. Excellent stuff all.